Aptech Systems, Inc., develops and markets mathematical and statistical software for schools, business and government agencies. 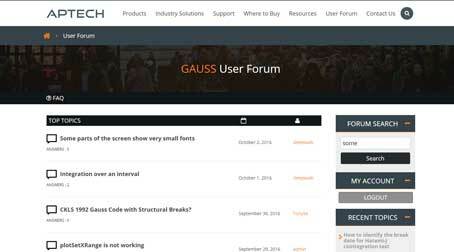 GAUSS provides the speed and power necessary for solving real-world problems . . . FAST! GAUSS is a complete numerical analysis environment used by technical professionals in all fields for everything from basic statistical analysis to solving optimization, forecasting, time series, and data analysis problems of exceptionally large scale. Built-in functions and optional modules make virtually any kind of analysis possible. Notice: Aptech Systems will never call you and ask for personal or computer related information. Contact us if you have any questions.